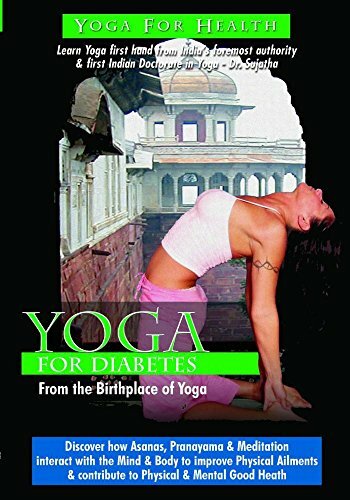 Yoga for the diabetic is a scientifically designed series of postures and breathing techniques that works each system in the body through contraction and extension. The postures address every bodily system, working the organs, glands and nervous system in a systematic way. While Yoga cannot "cure" diabetes, it can complement the lifestyle changes necessary to keep diabetic symptoms in check, and it can help you feel more in control of your health and well-being . The DVD contains a unique "Real Time" workout program that lets us focus only on the performance of the asanas, while the program leads you through the sequenced asanas with audio assisted timing. This program covers asanas for diabetes including: Padmasana, Tadasana, Ardhakati Chakrasana, Parivrtta Trikonasana, Ardha Chakrasana, Prasarita Padahastanasana, Vajrasana, Supta Vajrasana, Maha Mudra, Jaanu Sirasasana, Paschimottasana, Salabhasana, Bhujangasana, Dhanurasana, Navasana, Jatra Parivruttasana, Survangasana, Matsyasana and Savasana. If you have any questions about this product by TMW MEDIA GROUP, INC, contact us by completing and submitting the form below. If you are looking for a specif part number, please include it with your message.